In part, this discussion is a companion to another discussion entitled ‘Brave New Worlds’ that considers the future of humanity. One aspect of this future will undoubtedly depend on the development of energy technology, which might be impacted by the climate change debate. 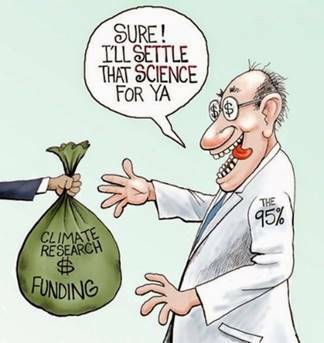 While the cartoon is possibly too biased towards a certain inference, it is possible that climate change has become ‘big business’ and the focus of much money, not only in terms of research funding, but also the job security for many thousands of others. But what is still being debated? Today, the headline news appears to suggest that the climate change debate is over as 95% of climate scientists support the idea that greenhouse gas emissions, predominately carbon dioxide (CO2), produced by humanity since the industrial revolution, are the root cause of global climate change. This effect will then produce temperature increases that will ultimately trigger a series of disastrous climatic changes in a matter of decades. In summary, this appears to be the general conclusion of the Intergovernmental Panel on Climate Change (IPCC), which is an international body for the assessment of climate change. It was established by the United Nations Environment Programme (UNEP) and the World Meteorological Organization (WMO) in 1988 with the stated aim of providing the world with a clear scientific view of the current state of knowledge in climate change and its potential environmental and socio-economic impacts. How did the IPCC undertake this task? And finally reverse-engineer current data back to align with pre-industrial data. Of course, as in all fields of science, models are by definition a simplification of the real world and this might be especially true for all climate models given the obvious complexity of the Earth’s climate systems. In this respect, the certainty implied by the 95% consensus figure appears somewhat at odds with the statements given in the many IPCC reports that appear to highlight certain reservations about the accuracy of its climate models and the poor levels of scientific understanding on which aspects of these models have been constructed. Note: In practice, these reservations are usually confined to the full IPCC 7000-page reports and do not necessarily get highlighted in the IPCC’s 30-page report for policy makers, which only summarise the results in terms of the estimated future temperatures, extreme weather events and mankind’s overall influence on temperature. Unfortunately, much of the media, and Internet sources, only tends to highlight the most sensational implications of the summary reports, e.g. world’s major cities to be under water by 2100. But surely the weight of authority of a 95% consensus is overwhelming? The Mysearch website has often cited an essay by William Clifford entitled ' The Ethics of Belief' and while written in 1877, Clifford argued that ‘ it is wrong always, everywhere, and for anyone, to believe anything on insufficient evidence’ . While this argument is assumed to still be valid today, possibly more so in a world being filled with fake news, it must be applied to both sides of the debate. Note: Clifford’s argument might be said to rests on three supporting guidelines. 1) A duty of inquiry, which prefers doubt to simple acceptance and believe. 2) A weight of authority provided there are grounds for supposing that they know the facts in so far as they may be known. 3) Limits to inference, such that knowledge may only be extrapolated when it does not contradict what we already know. As such, this discussion is simply undertaking a personal duty of inquiry, where the weight of authority may include experts from both sides of the debate, see Appendix-A and Appendix-B for more details. However, we will start with an inference that the predictions of today’s climate models need to be questioned more closely, both in terms of method and accuracy. In 2014, Steven Koonin published an article in the Wall Street Journal entitled ‘Climate Science Is Not Settled’ from which the following extract is taken. As far as this discussion is concerned, this does not appear to be an unreasonable summary from which to proceed as it does not deny climate change nor the fact that excessive CO2 can influence the climate. However, it does table a question concerning the scope of change that can be attributed to natural and man-made causes. While this discussion does not have the weight of authority to definitively answer this question, it is entitled to carry out its own duty of inquiry rather than just accepting the current consensus. To help the wider distribution and review of this web based discussion of climate change, it is also reproduced in the form of a PDF file: CC-Debate.pdf. The headline all appear to suggest that the climate change debate is over as 95% of climate scientists support the idea that greenhouse gas emissions produced by humanity since the industrial revolution are the root cause of global climate change. This effect will then produce temperature increases that will ultimately trigger a series of disastrous climatic changes in a matter of decades. In summary, this appears to be the general conclusion of the IPCC, which is an international body for the assessment of climate change.